(Newser) – Thai police have released stills of security footage they say shows the man—wearing a yellow T-shirt—who set off the explosion in central Bangkok yesterday, killing 20 and injuring 140. "The yellow shirt guy is not just the suspect. He is the bomber," a police rep tells the AP. 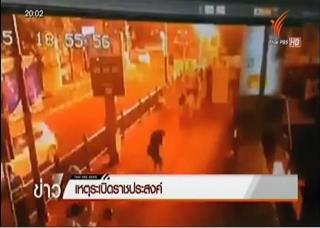 The images were taken from video at the Erawan Shrine before the bombing. In some, the man is carrying a backpack. In others, it's missing. Video footage spreading on Thai media apparently shows the same man taking off his backpack while sitting on a bench at the shrine. He then walks away, leaving it behind. A police chief says the bomb was made with a pipe wrapped in cloth. Earlier today, a second explosion hit the capital, this time at a ferry pier, but no one was hurt, police say. Napoleon Dynamite comes out of hiding - Uncle Rico youre next! Anyone, no matter the reason, that indiscriminately kills, has no legitimacy. "They want to destroy our economy, our tourism." This sounds like when George Bush said, they” hate our“freedom,” our “democracy,” and “our way of life.” This was after the Weapons of Mass Destruction lie, and before he tanked the world economy causing people to loose their jobs, homes, and retirement funds, while bailed the banks out to the tune of $800 BILLION of taxpayer dollars.